This spot the differences activity is great for the long winter months. Whether you love to ski or you are an expert difference finder, there is something here for everyone. 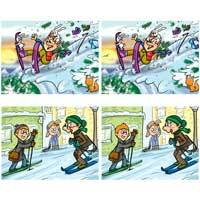 Look closely and find the ten differences in these two snow filled sets of images.